As more and more information is available on the internet, Laois is making its presence felt! Below is just a selection of the great resources available to anyone with an interest in the built, natural or cultural heritage of the county. 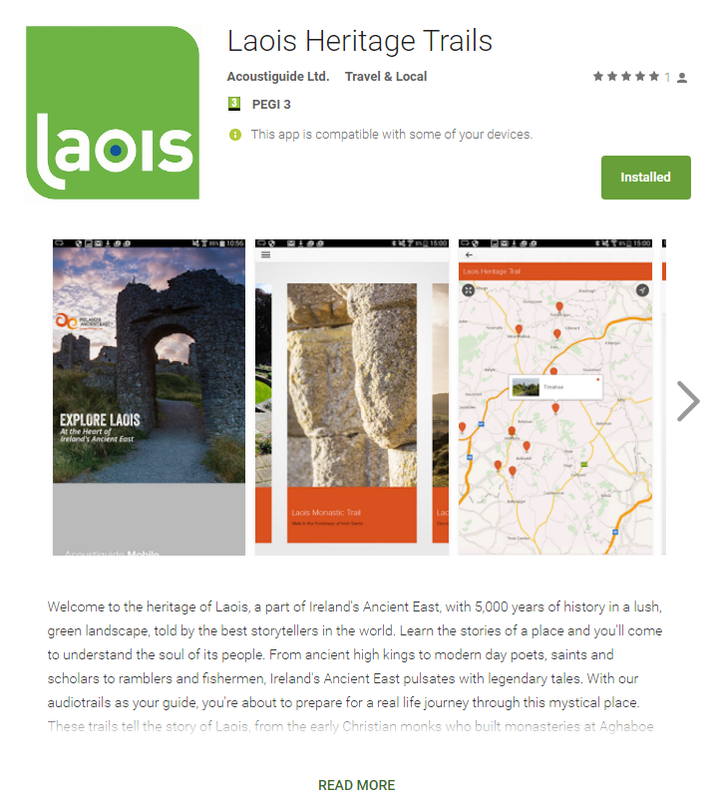 As part of the Ireland’s Ancient East programme and with grant aid from Failte Ireland, we have released free smartphone app, with photos, maps and multilingual audioguides to the Laois Heritage Trail and Laois Monastic Trail. Available to download free of charge, several audioguides have been created to help you explore and enjoy the heritage sites of County Laois. These have been published by Laois County Council, created by Abarta Heritage, with the support of Laois Tourism and Laois Partnership. The guides are suitable for downloading to your smartphone, or can be burned onto CD to listen in the car or wherever you like! They are also available to listen to on Soundcloud, via the links below. The Laois Heritage Trail is also available in Irish, French, German, Italian, Spanish and Mandarin. The Laois Monastic Trail is also available in Irish, French, German, Italian, Spanish and Mandarin. These guides were produced in conjunction with Laois County Council, Laois Partnership and Laois Tourism. This project was part funded by Partnership through the European Agricultural Fund for Rural Development. A guide and a treasure hunt game, this free I-phone app was developed by Waterways Ireland with the assistance of the Midlands Regional Authority and input from the Heritage Officers in Laois, Offaly, Longford, Westmeath and Roscommon. Hold your phone one way and it’s a standard interactive guide to the tourist sites near you. Hold it the other way, and it turns into a fun treasure hunt around some of the Midlands heritage sites, with more information unlocked when you find and photograph particular features at each site. Available on the App store (for I-phone only at this point), the good news is the app doesn’t need wi-fi or even mobile signal to work – once it’s downloaded, it will work! The Laois sites that are in the app to be explored are the Round Tower at Timahoe and Emo Court. Hopefully you are already following Laois Heritage on Facebook and Twitter , but did you know that Laois Heritage is also on Google+,Instagram, Flickr and YouTube ? We’re just getting going on some of these and would love your ideas, comments and feedback! Abbeyleix was designated a Heritage Town by Fáilte Ireland. A video on the heritage of the town is here. Link appears courtesy of Andrew Ring. The council wish to thank Andrew Ring for this use.